Dubai-UAE: 13 March 2014 - His Excellency Eng. Mohammed Ahmed bin Abdul Aziz Al Shehhi, Undersecretary, UAE Ministry of Economy, today officially launched the website for the 15th GCC Joint Exhibition that will be held under the patronage of His Highness Sheikh Dr Sultan bin Muhammad Al Qasimi, UAE Supreme Council Member and Ruler of Sharjah, under the theme ‘Made in GCC’. To run from 26-30 May at the Expo Centre Sharjah, the event will be organised by the Ministry of Economy in conjunction with the General Secretariat of the Gulf Cooperation Council and the supervision of the GCC Exhibition Officials Committee. During the website launch ceremony, the Ministry of Economy and Expo Centre Sharjah signed a Memorandum of Cooperation for the joint management of the exhibition. The agreement was signed between His Excellency Eng. Mohammed Ahmed bin Abdul Aziz Al Shehhi, Undersecretary, UAE Ministry of Economy, and His Excellency Saif Al Midfa, CEO of Expo Centre Sharjah. During the inauguration ceremony that took place at the headquarters of the Ministry of Economy in Dubai, Eng. Mohammed Al Shehhi affirmed, on behalf of His Excellency Sultan Bin Saeed Al Mansouri, Minister of Economy, that the exhibition industry is one of the most important in the world with close to half a million trade events held annually with a value exceeding US$300 billion. He stressed that the exhibition industry in the GCC countries in general and the UAE in particular supports sustainable development. More specifically, the UAE’s winning bid to host Expo 2020 in Dubai is clear evidence of the country’s capabilities in hosting and organising world-class events. At the conclusion of his speech, Al Shehhi praised the efforts of the trade exhibitions officials in the GCC countries to prepare for the 15th GCC Joint Exhibition and implement the decisions of the GCC Trade Cooperation Committee in their commitment to achieving the desired outcomes. He also stressed on the keenness of the UAE represented by the Ministry of Economy and its strategic partners led by the Expo Centre Sharjah to organize the exhibition in cooperation and coordination with the General Secretariat of the Cooperation Council and all sister states. He affirmed that the exhibition ‘Made in GCC’ is not limited to a specific type of industrial sectors but aims to support and showcase GCC-made products from the commercial, industrial and services sectors. His Excellency Undersecretary of the Ministry of Economy noted that the economies of the GCC countries have achieved good growth rates reaching 5.5% in 2012. The GDP of the GCC region amounted to US$1.48 trillion in 2012, while net current account surplus amounted to US$378 billion, and total GCC foreign assets increased to US$2.2 trillion. Al Shehhi added that the Ministry of Economy aims to organize a forum for businessmen in GCC countries on the sidelines of the 15th GCC Joint Exhibition, under the theme ‘Deepening economic integration between the Gulf countries’. His Excellency Saif Al Midfa, CEO of Expo Centre Sharjah, expressed his thanks to the Ministry of Economy, namely His Excellency Sultan Bin Saeed Al Mansouri, and His Excellency Eng. Mohammed Ahmed bin Abdul Aziz Al Shehhi, Undersecretary of the Ministry of Economy, for their meritorious efforts to the UAE’s exhibition and conferences sector, globally, regionally and locally. He added that such efforts led to the enhancement of the sector's position, increasing its contribution to the Gross Domestic Product (GDP) progressively, year after year. 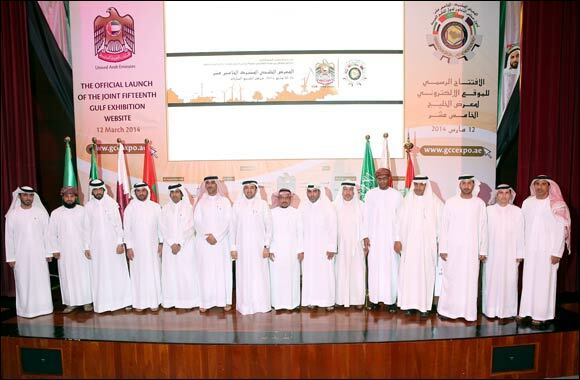 GCC Joint Exhibition is organized every two years in one of the GCC countries under the supervision of the General Secretariat of the Gulf Cooperation Council. Kuwait hosted the previous edition of the event.